REPORT: Wildfire Hits Fox News Chairman Rupert Murdoch's $30M Bel-Air Mansion And Winery [VIDEO] - Joe.My.God. NBC News reported Wednesday morning that the Los Angeles wildfires ravaging the area near Bel-Air have now begun to consume Rupert Murdoch’s property. “This is the $30-million house and vineyard property that is owned by Rupert Murdoch,” NBC Los Angeles reported on the latest victim of the 125-acre Skirball fire. 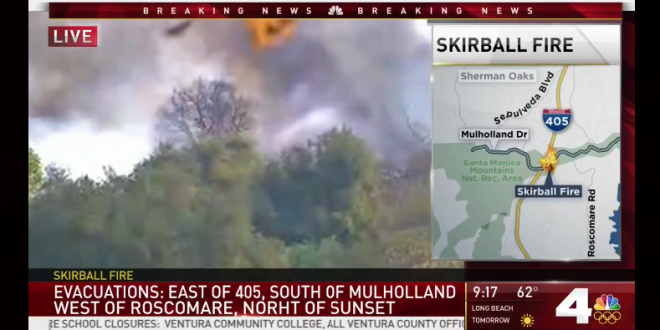 “And it looks like it is burning on the hillside.” Murdoch owns the Moraga Estate vineyard, which is right near the 405 Freeway, which has been partially closed as fires rage. Murdoch’s property is “a wine growing estate in the Santa Monica Mountains at an elevation of 600 to 900 feet, five miles from the Pacific Ocean,” according to the Moraga’s website. The 86-year-old Australian-born media mogul lives in a 7,500-square-foot house on the estate with wife Jerry Hall. Burning down Rupert Murdoch’s house only gave him incentive to innovate new technologies that stop fire forever. Huge miss for fire.